Come down and Meet Sonni Cooper, the artist and author, May 3rd from 7-9pm. She will be on-site at the Garrett’s Desert Inn, don’t miss this great opportunity to meet this living legend. Star Trek Author, artist and living legend Soni Cooper arrived in New Mexico in 1957, from NYC. She was a friend of Jackson Pollack, who influenced her to create richly textured, many layered collage paintings, now unveiled at the Garrett’s Desert Inn now through June 15th, 2014. Sponsored by Last Gallery On The Right, Santa Fe, New Mexico. Sonni Cooper has been a professional actress, dancer, anthropologist, screenwriter, and wrote the best selling Star Trek novel Black Fire, which sold over a million copies. She was and continues to be an artist. 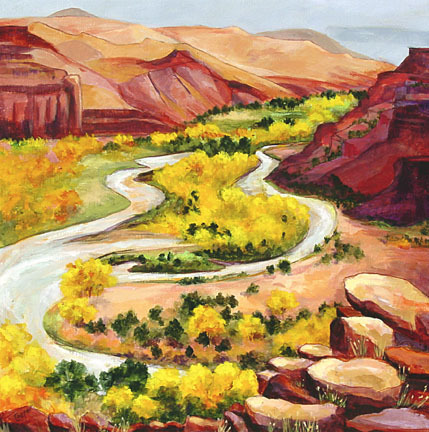 Her paintings will be for sale at her reception and she will read from Black Fire and her novel Riding The Rainbow, inspired when she was Assistant Director of Eight Northern Pueblos Council. Sonni was selected as Internationals Woman of the Year in the field of art, and as one of the outstanding 2000 intellectuals of he 20th Century by the International Biographical Centre, Cambridge England. She is a member of the Science Fiction Fantasy Writers of America, Screen Actors Guild, Mensa, and is a Sequoia member of the American Indian Science and Engineering Society.